In time for Theresa May’s visit to Brussels this week, Andrew Duff has written an improved version of the Political Declaration accompanying the Withdrawal Agreement, as a basis to prevent a hard Brexit. Andrew Duff is a former Member of the European Parliament (ALDE). Theresa May is facing in the wrong direction. The prime minister is trying to persuade a small number of anti-Europeans to swing behind some version of a Brexit deal in the next critical Commons vote on 14 February. She tries in vain. Most of the arch-Brexiteers are visceral nationalists who loathe and fear the European Union. Some are just out to destroy May’s premiership. Many of them are uninhibited by intellectual ability. And, to cap it all, the prime minister has undermined the Withdrawal Agreement on offer from the European Council by seeking to eliminate or to time-limit the Irish backstop. The EU waits impatiently for May to spell out what viable alternative to the backstop she has to propose. She has none. The EU institutions have made it very plain that they will not reopen the Withdrawal Agreement, but they are willing to modify the accompanying Political Declaration. This is sensible. In truth, the Declaration is not very well written. It is all very well for Sabine Weyand to calls the first draft “a work of art”, but it is in no sense a work of literature. 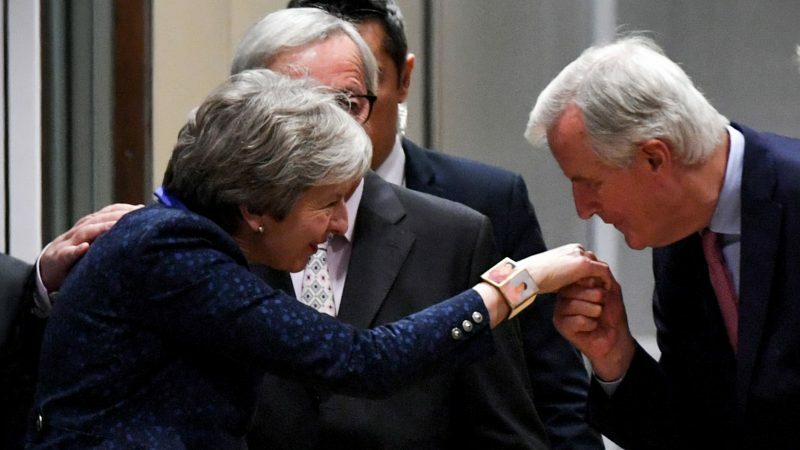 It has been too easy for British MPs and press to criticise the Declaration, at one and the same time, as imprecise, not long enough, too long, too constraining, and, above all, non-binding. Despite its critical reception, neither the Commission nor Council is prepared to redraft the text, preferring to wait, once again, for London to make the first move. At Westminster, meanwhile, there is a large but disorganised rabble of dejected Remainer MPs who want a deal that respects the result of the referendum and avoids no deal. For them, a revised Political Declaration would need to leave the UK much closer to the EU than Theresa May has proposed. It would have to ditch some of her red lines, notably her refusal to accept continuing membership of the customs union and her dogged rejection of mobility of persons. I have turned the tentative and conditional language of the original into something much more positive (“will” rather than “could”). The purpose and content of Britain’s final Association Agreement with the EU is spelled out clearly. Without pre-empting the negotiations of that Association Agreement, I have sought to widen its parameters to include the possibility of a permanent customs union, and more mobility of persons. These changes would commit the UK to a higher degree of regulatory alignment than that originally envisaged, with consequent benefits for freer trade in both goods and services. The UK would seek associate (non-voting) membership of the EU agencies. I stress the need for the closest possible collaboration in matters of internal and external security, and accentuate the importance of the institutions of joint governance. A revised Political Declaration should be used to clarify once again the real nature of the Irish backstop and its transitory function. If the legal standing of the Declaration can be enhanced, as the prime minister wants, the accusation that it is ‘non-binding’ should be silenced. When the prime minister comes to Brussels later this week, Presidents Juncker and Tusk will have to work hard to turn Theresa May around to prevent a hard Brexit. Improving the Political Declaration is the way to do it. I have the greatest respect for Andrew Duff’s expert analytical abilities and insight in EU – UK politics, but think there’s just too much common sense in his proposal. He must have worked his heart out on this and I think we should keep it, for future use. Had his advise been sought from the start ( it wasn’t, they sacked him) there might be a good ending to it all. At this time however, the only thing that will change the minds will be a mass landing of UFOs in London. Anything less just will not do.